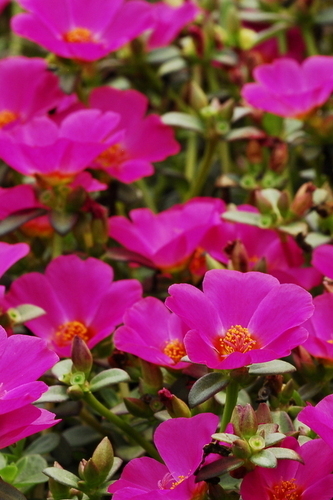 Companies the world over can only dream of having staff arrive at work as punctually as a portulaca blooms in the morning time. Having said that, if staff mimicked these timely treasures, they’d only come into work on sunny days so the “better late than never” trade-off is probably worth it. 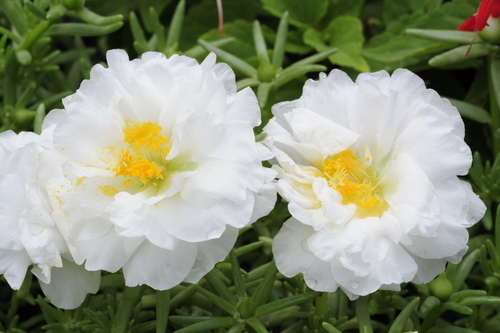 More commonly known as moss-rose, portulacas native roots are in Argentina, southern Brazil and Uruguay. Portulacas blooming good nature has afforded it some interesting names around the world from the more flexible “Time Fuul” which means “Time Flower” in Bangladesh to the more precise “Nau Bajiya” meaning “9 O’clock Flower” in India and “Hoa mười giờ” meaning “Ten o’clock flower” in Vietnam. Plant up a few trays of these beauties within eyeshot of your desk and won’t need to check the time to see when your tea break is, except on sunless days of course, so it’s probably not wise to toss your desk clock out the window. It’s probably obvious by now that what these gorgeous treasures need is sun. Lots of it, in fact, the whole day long if possible. Luckily most gardens have those patches where not much grows because it gets too much sun, and the soil is not terribly fertile because of the hammering it gets from the unrelenting rays. This is the perfect place for your portulaca, and the once desert looking patch will turn into a fiery colour palette before you know it. It’s quite simple, just remember to avoid areas with shade or waterlogged soil and don’t worry if the soil is not rich with nutrients because they’ll grow in sandy soils with practically no attention. Being water-wise little plants, keep the water in the tap until it’s needed and try not to pummel their soft leaves with hard overhead watering. Plant up your portulacas in rockeries, hanging baskets, pots, between stepping stones and even as a ground cover if that is what you need. Their eye-catching colours will make any of these areas impossible to miss. They are available in scarlet, orange and yellow for the bolder gardener or white and pastel shades for a more understated feel. 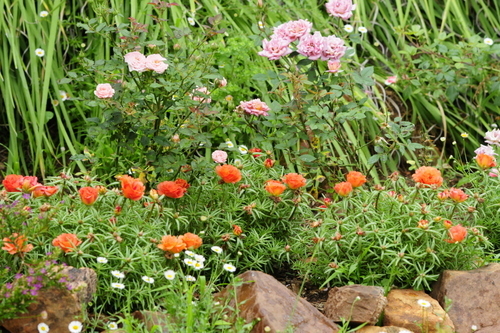 There is no need to dead-head portulacas, but giving them a good (few inches) haircut in late summer when they get leggy will afford you another blooming burst in autumn. For the most part, even though people find them eye-catching, luckily not many pests share our view. If you find nematodes and aphids seem partial to your crop, planting a couple of Marigolds as companions will act as a natural pest repellent. An added feature, which not many people are aware of is that they attract bees in their droves! Don’t get a fright if your flowers die after the bees have visited though because it’s perfectly natural for them to do so about an hour after pollination. Colourful, water wise, easy going and will fill a patch in your garden where not much else will thrive, what more could a gardener want?